It seems that some users of the popular WhatsApp Messenger have used the announcement of Facebook's acquisition of program and company to switch to another messenger application on their system. One app that is mentioned quite often is Telegram, an application that is officially available for iOS and Android, and unofficially for a variety of other mobile and desktop operating systems including Windows Phone, or Windows, Mac and Linux desktop systems. Telegram feels a lot like WhatsApp. It uses phone verifications during the account creation process, supports the sharing of photos, videos and documents, as well as group chats. But, there are differences when you compare both clients. Telegram is entirely cloud-based using encryption -- strong according to the developers -- to protect user data. 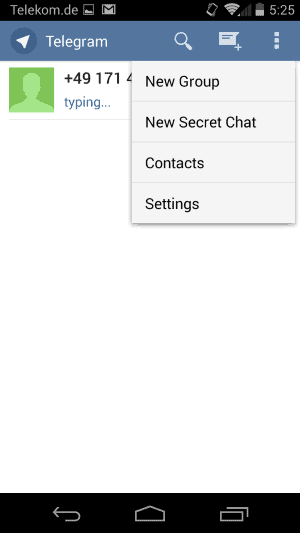 Another interesting feature is the clients secret chats option. When you create a secret chat, Telegram uses end-to-end encryption to make sure that all message contents are protected from third-parties. Messages that are sent using the secret chat feature can be programmed to self-destruct, which removes them not only from the recipients system, but also the originating one. It is also free and the developers have promised that users won't be charged a yearly subscription fee or see ads in the client. One question that should come up is how the makers of Telegram plan to support further development and the infrastructure that the cloud-based solution requires. According to the Telegram FAQ, the messenger is supported by Pavel and Nikolai Durov who have created the VK social network. The only money-generating options the makers consider are donations or the addition of paid features that are non-essential, and those only when the support money that the project receives from Pavel runs out. Telegram is an open source project, which means that the source code of the project is freely available. Not all of the source seems to have been released by the team right now. According to information posted on the official website, the team focuses on open sourcing code that allows third-party developers to "build something using" the api. The FAQ for the technically inclined goes into detail in regards to the protocol and technicalities. You find detailed information about the encryption and authentication used, and how the app protects itself against known attack types. Accounts can be deleted at any time. If that happens, all user data including messages, contacts associated with an account and group associations are removed from the system. This does not mean that all messages are gone though, as recipients will still have their copies of messages that the deleted user sent to them. To avoid this, use secret chats exclusively. All chats are encrypted, but secret chats use end-to-end encryption between two user devices, while regular chats use client to server to client encryption types instead. This means that secret chats are not stored in the cloud. Not everything is golden right now. The security needs to be audited for instance so that the claims the developers make are confirmed. 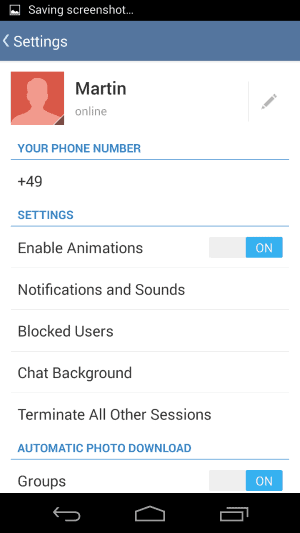 The client lacks a couple of features that WhatsApp supports, including the option to hide the last seen status in the messenger. Switching to another messenger is not always an easy undertaking, considering that you need to convince your friends, family or contacts to do the same. It is likely that you will be running multiple apps for a period of time because of that. What's your take on Telegram? My take on Telegram, aside from hiding the last seen status, is the lack of broadcast. Other than that it is ready to take over Whatsapp. I am happy to say that users in Germany, Switzerland and The Netherlands are moving in droves. Telegram ranks #1 in the app store in these countries. This move was preceded by Spanish speaking countries, which discovered Telegram even before Whatapp’s acquisition. could you please present another great alternative, Surespot? I think it’s much more secure than Telegram, because every chat is encrypted with correct algorithms, Telegram is not doing good here. Surespot will get group chat soon (jn about 6 weeks) and also those will be encrypted. The developer’s support is great, he replies to every question. Please give Surespot a try, Telegram wants too much permissions, is not fully encrypted and needs phone numbers. Boo! I’ll take a look but cannot promise anything. Thanks for the recommendation though and the Telegram link, good reads. Inmiddels lijkt Telegram vrij viraal te gaan, want het regent contacten die blijken over te stappen. Daarmee neemt de waarde van Whatsapp af. Volgens http://www.telegrammessenger.nl/ is en blijft telegram altijd gratis. Of Telegram uiteindelijk niet hetzelfde pad opgaat, valt moeilijk te voorspellen. Maar duidelijk is wel dat als je op internet een vertrouwensbreuk pleegt de klant snel weg is. I’m sorry, but most websites that are in English normally require that all comments also be in English. p.s. they are not speed skaters but long track skaters. I was reālly pissed off when on 20.02. in Telegram messenger on iOS I’ve got a message that one contact joined Telegram. It was some “David” with number starting with +34, i.e. the Netherlands, who is not known to me: I checked thoroughly Contacts on my iOS device , and didn’t find any David like him or with such telephone number . So, I filed compliant with Telegram RE: WTF Telegram approach me with unsolicited contacts. Hello! Due to the recent events Telegram became instantly popular in many countries all over the world. Because of this our team had to improve synchronization for contacts with local numbers, the ones without a country or city code. Unfortunately, while trying to improve the contacts sync we broke it for a short period of time yesterday. As a result you might have been notified about random people from different countries signing up for Telegram and a fraction of them could contact you. The problem was fixed yesterday. We tried our best to delete all wrongly imported contacts. We are really sorry about the inconvenience this may have caused to you. What I can say that such trivial bug put whole cluster of promises of security by Telegram people under suspicion. “Yes we are very professional in sophisticated things, but sometimes slipped on trivial stuff”- huh would believe it? Then, as this company is Russian – and I am Russian myself and I know the psyche – if more than common to come forward with numerous sweet promises AND at the same time do simply do absolutely nothing to deliver on them. I can’t help myself but not to trust that Telegram delver on all of its promises of security etc. as described on its website, sorry. 34 is the code for Spain, 31 is the code for Netherland. Correct,+34 is for Spain , can’t remember precisely all int’l prefixes by heart. But it doesn’t change the fact that in super-duper secure Telegram messenger invaded my and “David”‘s privacy by presenting him as “Contact who just have joined Telegram”, for Telegram here acting dating agency alike. Even more, even if assume that was just one-time bug, then it is apparent that Tekegram has not rectified consequences of it: in Chats I still see David and can contact him if I wish – professional approach for Telegram would be to take steps and remove all such pieces automatically. Obviously , either Telgegram’s infrastructure is not capable to cope with such privacy failures, of they simply do not care. MY RESPONSE: Oy. What part of the “[grin]” did you not understand. Yikes. PAUL(US) WROTE: p.s. they are not speed skaters but long track skaters. MY RESPONSE: Really? You write English like that and then you’re gonna’ parse mine? And please bother to figure out the difference between US Republicans, (Insani)Tea Partiers, and lifelong registered liberal/progressive Democrats like me. I’m the *LAST* person who would be pro-US nationalistic in the way you suggest. Bother to figure-out with whom you’re communicating. My position on things, including a huge body of criticism of my own United States, is everywhere on the web. And are you really going to make a medal count argument? Seriously? And, worse, equate that to any kind of national “greatness?” Are you kidding? They’re mutually exclusive. Plus, all of these things go in cycles; always have. A country’s on top for a string of Olympics, and then its stars retire, and then there’s a period where the youngsters grow-up and become the new stars. If you had been alive long enough to actually SEE that cycle, you’d both understand, and know what it actually means. None of that, by the way, has anything to do with the real point of my previous email: Nearly no English-language website out there allows non-English language posts. It’s rude and exclusionary to the English-language-speaking/writing participants. It’s not an arrogance (Dutch websites typically only allow Dutch posts; etc. ), it’s just the way things are. Most importantly, it has nothing to do with ugly-Americanism; or American presumption of superiority. Geez, get a sense of humor. Nice you did not understood the sarcasm even with the extra clue present, being the smiley face! PAUL(US) WROTE: …you did not understood the sarcasm even with the extra clue present, being the smiley face! …and so we misunderstand. Yes, emoticons (created in the earliest days of dial-up bulletin board systems and AOL chat rooms) help; but as you seem to be suggesting, here (and as I suggested, before that), they don’t always work. …and so when you, me and God all know that it wasn’t as “kidding around” as the smiley face emoticon which followed it would attempt to fool s/he at whom it was aimed into believing, what happened here is what happens. The old saying “please don’t pee on my leg and then tell me it’s raining” comes to mind. But, hey… maybe that’s just me. I have used it off and on for years and never had any problems with it. Actually I liked both it’s convenience and it layout. For me it was soooo much better than keeping several message clients open at one time. I know Trillian had a couple of hiccups in the late 90’s but thev’ve been taken care of as far as I know. And it’s feature set is sufficient for my needs as it covers multiple message/email services. Unless there’s a new security issue that has immediate substance, I can’t think of a reason to move elsewhere. Is there something I should know? Or can I go back to my coffee now? What Whatsapp and Telegram do is not really the same thing as what Trillian does. Both Whatsapp and Telegram are primarily to provide free SMS services, alternative to the SMS provided with a cell phone; and since most US cell phone carriers now offer totally-free SMS, apps like Whatsapp and Telegram are actually far more popular everywhere except the US… especially in countries where a single text message can cost up to $.25(US) to send… and in some cases, even just to receive. The salient benefit of apps like Trillian is that in a single app (Trillian, in your case), one may send/receive instant messages (IM) through a wide variety of IM systems, thereby eliminating having to have the app for each IM system running in one’s system tray. One app (in this case, Trillian) is all that sits in the system tray, yet it can send receive IMs through the Yahoo IM system, or the AOL IM system, or the Microsoft IM system, or the ICQ IM system, etc,. etc. Trillian, and either Whatsapp or Telegram, are actually different kinds of apps, using different kinds of systems. Trellian uses the IM system; and both Whatsapp and Telegram either use or mimic SMS systems. IM and SMS are not the same thing. That said, what makes the unambiguously IM-system-based Trillian a little confusing, such that it can be easy to get it confused with true (or mimicking) SMS systems like Whatsapp and/or Telegram, is that Trillian has an app version that runs on cell phones; and so the line between traditional IM and true (or mimicked) SMS begins to get blurred. Regarding Trillian: I’ve never liked that it is not really free. I mean, yes, there’s an entirely free version, but it’s feature-limited and designed, really, to just whet the user’s whistle and make him/her wish s/he had the premium/paid version. I hate that game. Part of the aforementioned line-blurring also happens whenever the IM-system-based app also does video chat. At that point, products like Skype become competitors; even the video chat feature of Google Hangouts. Another worthy competitor in the world of video chat is Tango. …but as you can see from that list, video chat and IM gets all mixed-up in there; so it’s easy to understand the confusion. Facebook’s purchase of Whatsapp, for such an outrageously-high amount of money, is confounding industry experts. Whatsapp is still a start-up, and has never made a single penny of profit; yet for the past few days it is suddenly worth even more than United Airlines. The revenue model is unclear — even to Mark Zuckerberg, based on what he’s been quoted as having said about the acquisition during the past day or two — and so precisely what he has up his sleeve is a mystery. When I first read about the deal, I though to myself that if he only spent a fraction of that amount of money on development, he could, in a year or less, develop what he could then call something like “FaceText” which replicates what Whatsapp does instead of purchasing Whatsapp for so much money that if I were on Facebook’s board, I’d be calling for a psych exam for Zuckerberg. For what it’s worth, I don’t think Zuckerberg should have bought Instagram, either. For a fraction of what he paid, he could have developed his own replicate of Instagram and called it something that he could have called, for example, “FacePic” or “FaceGram” or something like that. Seriously, the psych exam. That said, as is briefly talked about in the aforementioned video clip, Zuckerberg’s overarching strategy might be defensive; might be to acquire and get those products off the market so that they can’t hurt anything that Facebook either now does, or is planning on doing. In other words, something like my suggested “FaceText,” and/or “FacePic” or “FaceGram” may already be in development, and he just wanted to get what would be their competition off the market. Giant corporations do that all the time; and the salient benefit, in addition to eliminating the competition, is that it allows the acquirer to access all of their technology and their customer bases. It’s all very interesting… at least to me. Surely telegram is not so popular right now, but it nice replacement for whatsapp, you can make group of 50 people in telegram also :) which is 20 in whatsapp. One gets spammed a lot in Viber. Many in my wife’s large Filipino family sorta’ kinda’ standardized on it, and so she had me install it on all devices. However, in not too terribly long, we ended-up having to remove it from all devices because of the spammish messages. And I’m trying to remember what happened, but something about my communication with Viber about it really turned me off, and helped to tip-it-in for me that we’d bygod have nothing to do with it… but I just can’t remember, now, what it was. …to the point, in fact, that if anyone suggests anything else, we refuse it. If you want to video chat with us, it’s SKYPE (er… well… or Google Hangouts, I suppose) or nothing at all. It’s one of those two or we’re not interested. Life’s too short to glom-onto every new thing or app that someone suggests. Stick with the standards, I say, so that the most may be achieved with the fewest apps on one’s devices. Skype a standard? Well at least it’s a Microsoft closed-source standard. I would not touch US based Skype with a bargepole and for that matter the Israeli based Viber, although the latter is a great app on phone and desktop. Is it true that if you block someone on telegram they still can see your last status?? hi in telgram whats meaning of “name hidden joined telgram “?